Even the best cared for teeth can become chipped due to accidents, for example tripping over or sports injuries. Teeth that are weakened by decay can also become chipped when biting hard or chewy food such as toffee. If your tooth becomes chipped you should contact your dentist straight away because chipped teeth are weaker and can cause discomfort in your mouth. Left untreated they can also develop more serious problems because the sensitive inner parts of the tooth can be exposed. If you have a small chip in your tooth enamel, this can often be fixed with one quick visit to the dental practice. If a large part of your tooth has broken off, you may require more extensive treatment and more than one visit to the practice – your dentist will be able to advise you about this on examination. How is a broken tooth treated? A small chip to a tooth near the back of your mouth can often be repaired with a filling. A tooth-coloured composite material can often be used, which makes the filling largely unnoticeable. Your dentist may drill the tooth to remove any decay and to smooth the edges before the filling is placed. This can commonly be done in one visit. If you have a small chip on your front teeth, your dentist may recommend dental bonding. Using a tooth-coloured composite, this will repair your tooth and will be matched in colour as closely as possible to your natural teeth. Your dentist will apply a gel to the affected tooth, followed by an adhesive and the bonding material. This material is then shaped to look like a natural tooth and hardened using ultraviolet light. This procedure can also commonly be done in a single visit. When a large piece of tooth has broken away or when the natural tooth is very decayed, a crown or cap can be the best option. Crowns are tooth-shaped caps that fit over the top of your teeth and can be made from metal, porcelain or composite material. While metal crowns are the strongest, they are better for back teeth; porcelain crowns are the most realistic-looking and are better for teeth nearer the front of the mouth. A composite filling material will be used to give your tooth added strength before the crown is placed on top. 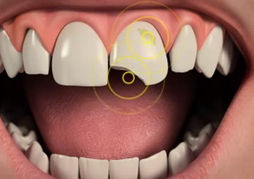 An impression is taken of your affected tooth and the corresponding tooth that bites down on it for your crown to be made. Your dentist may fit you with a temporary crown whilst your permanent crown is being made – this typically takes up to two weeks. When a front tooth is chipped, dental veneers are often used to disguise the damage. This is a quick and easy option to restore your smile. Dental veneers are thin slivers of porcelain or composite resin material, which is placed over the whole front of your tooth. Your dentist will prepare your tooth by removing a small amount of enamel, and will take impressions of your tooth, which are sent to the laboratory for your veneers to be made. This can take from one to two weeks. Once your veneer is ready, your dentist will use a special bonding material to fit the veneer to your tooth.